The trick is: Get a domain… and then redirect it to the free platform. Why get a domain at all? The reason you should use a domain to do a redirect is because it makes your way of telling others how to find you online more succinct, memorable and user friendly. If you have a nice memorable domain name, you can send potential clients or employers to your Behance or any other platform without giving them a clunky URL with a backslash. The point is to begin to brand yourself instead of branding Behance – it looks way better on resumes and business cards too! Behance has a nice way of showing your design. You can use your Behance profile to display your designs either by project name or project type. Make sure you have a nice bio that includes your contact details (email or any other way to reach you). Have a clear profile image of yourself. Don’t use a logo as a profile picture. And here’s an article that elaborates on the topic. Idea: Not a must, but you can create your projects to be like a website pages. For instance “About me”, “Selected works 2016”, “Selected works 2015”, etc. Or maybe give each project just the client’s name. Or kind of design “Wireframes”, “UI Design”, “Icon Design”, etc. Behance also has a Pro version called “Adobe Portfolio”, and for a fee of $9.99 (or if you already have a paid account for Photoshop or any other Adobe application you get it for free) they offer a drag and drop editor to create your portfolio. We’re not even sure we can recommend it over the free version of Behance which works amazing and really impresses once done right. These days potential employers or clients are looking more to understand your train of thought, for me, when I was looking to hire more designers to the team, I always searched for seeing how they think, and if they express it online in places like Medium or a personal blog. Designs are important, but not as much as understanding how someone thinks. If I look at a visual case study these days I expect to see 30% designs and 70% text to explain the process, the problem being solved, and the decisions made to get to the solutions suggested. Medium is a great way to display your thoughts & works. When done right, you get a great mix of thought leadership pieces with designs that really represents well how a person thinks. There’s also a great reason to create your web representation on Medium – it’s because of something called ‘perceived value’. You know how some products when designed well, even with no budget and from a garage, can look and feel like they came from a fortune 500 company? Well this is called Perceived Value. How is this connected to design? Well, Medium’s design is very elegant, and makes your thoughts and case studies seem smart even before reading one word. It’s also a platform where the world’s smartest people and top thought leaders express their thoughts, so even the platform itself already brands you better than any other custom platform. Lastly, it’s so easy and feels great to write on Medium. If you’re not familiar with their editor – you should try it.. Even just for inspiration’s sake. If you’re a frond end developer, you might consider redirecting your domain name to a codepen account, where you can show off your front end skills. Github is also a valid option, check out this interesting discussion on DN. 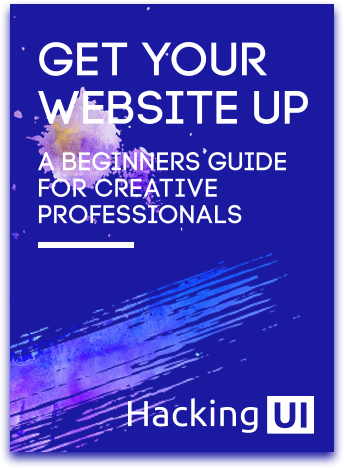 There are a lot of other free/freemium/paid options out there that will save you from paying hosting and creating a good ol’ fashioned website for yourself. We can’t possibly mention them all. You’ve probably heard of About.me, Webydo, Wix, Cargo Collective, and more. How do I redirect my domain to one of those websites if I do decide to go with one of them?